A/C EasySeal prevents and/or repairs leaks throughout the system - even condensers, evaporators, copper lines and soldered joints! Injected into the system, it mixes with the refrigerant rather than the system's oil to more quickly locate leaks, meaning less sealant usage than those that mix with the system's oil. It identifies moisture or air resulting from a leak, and forms an impregnable seal. A/C EasySeal is essentially inert - not reacting with any system materials or liquids until it locates a leak by coming in contact with air and/or moisture at the leak site, which also means it's a time and money-saving method for quickly locating leaks in the system versus the need to search for the smallest leaks. Your contractor can add it to the system with confidence - no more time-consuming leak searches! 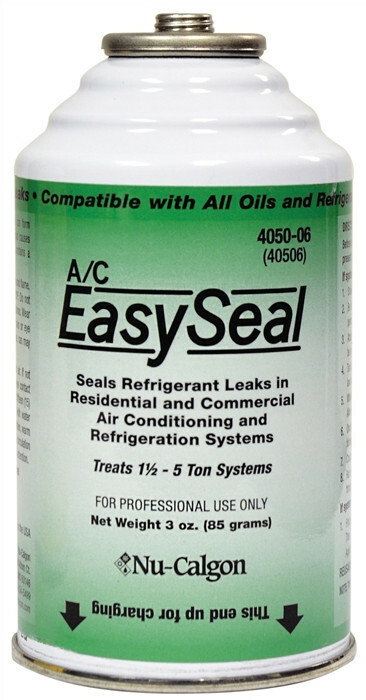 The majority of cases have, in as few as seven days, used one can of A/C EasySeal to seal systems that have little to no refrigerant remaining and is for large systems up to 5 tons.